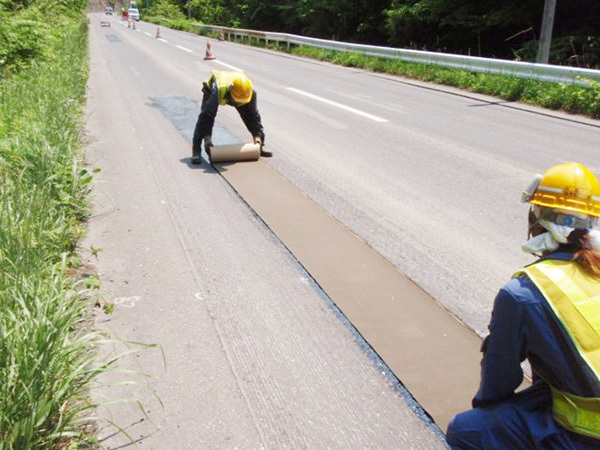 SAMI SHEET is a reflection crack absorbing sheet that uses glass fiber cloth as the base material which has been impregnated with modified asphalt. Has outstanding flexibility, so that it adapts well to the paving surface. Has an excellent adhesive capability with the paving surface. The sheet has outstanding tensile strength. 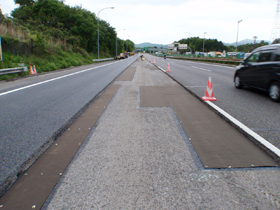 Because the material has an adhesive layer, handling is easy during implementation at normal temperatures. Reflection crack absorbing for paving in which cracking has occurred. Reflection crack absorbing for concrete paving joint parts in composite paving. Maintenance and repair when considering the life cycle cost.